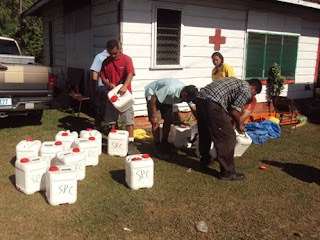 As I was uploading this morning's post, I received a text from Joey 81, who often works with Samoan Red Cross. 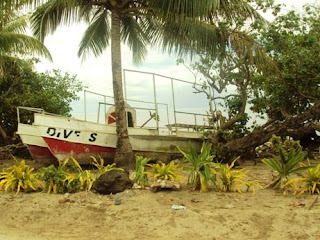 They were looking for volunteers to go work in affected villages on the south side of the island. With school canceled, I had nothing better to do. I asked Joey if I should bring anything. He said I should wear shoes. Good call, Joey. At the Red Cross building a thousand different people were doing a thousand different things. Some filled water containers with a hose, some were painting makeshift banners to affix to the hoods of volunteers' cars, some were trying to figure out what to do about donated clothes and groceries. I found my friend Ruane, who drove a Toyota pickup truck. 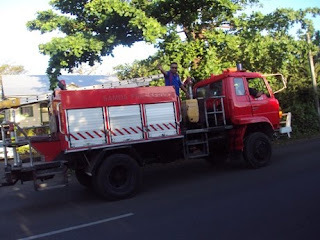 We loaded it with nineteen 20-gallon water containers, went to her house to fill them (since there was only one hose at the Red Cross), and then headed out to Lalomanu. 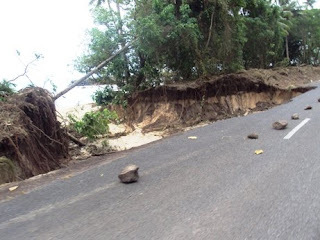 There have been reports coming in from lots of sources about the damage to villages along the south coast. Saleilua took quite a hit. Salesatele was reeling. Many resorts including Sinalei, Coconuts, Vavau, Iliili, and Sea Breeze had taken hits hard enough to put them temporarily out of business. 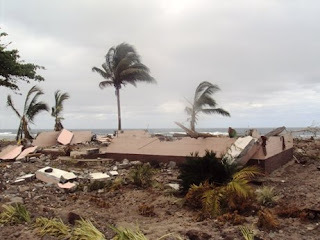 Beach fales in Tafitoala and Saleapaga and Lalomanu were leveled. We'd heard about all this. But nothing is more sobering than driving through a familiar village and finding it unrecognizable. The Faofao Beach Fales are gone. There's nothing there. The building is leveled, the fales themselves have been swept away. I only knew we were there because of the newly installed speed bump. In fact, Ruane, who's never stopped at Faofao, was the one who said, "I those were beach fales there." I had no idea. Locate those who didn't survive. The camp had enough water, so we drove a little farther up the eastern coast to Saleaaumua. A Senior Red Cross Volunteer, Opi, hopped in the backseat. His method of distribution seemed fairly simple: When people ask for water, give it to them. With the Red Cross logo on the front of the car, people would walk up or stop us on the road and ask for a container. And then we'd stop, hop out, and give them water. Done and done. We turned and went back to the hospital when we were out of water. 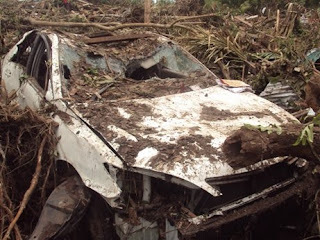 There, we were assigned to go down to Lalomanu tai to help with "clean-up" efforts. We later found out this was a euphemism for picking through rubble searching for the deceased. Searching for the dead is difficult in many different ways. Most rubble is heavy and haphazard and jagged. Sifting through, lifting and dropping, and finding footholds is strenuous, and Samoan humidity doesn't help. The scene is surreal. Dead fish, left behind by the ocean, litter the affected area. And then there’s the emotional leap (repression?) required to look for dead bodies. More than anything though, I felt like an intruder. Before the earthquake, I'd driven by the area we searched many times, but never did I stop to search the family’s possessions or prod through their kitchen. And yet there I was today, finding family photos and Quiksilver baseball caps and notebooks and aquatic charts and condoms and novels and gin. 2 days ago, it would have been completely unacceptable for me to trudge into these peoples’ lives; it’s as though with the loss brought on by the tsunami comes the loss of one’s dignity. I felt like I was snooping. 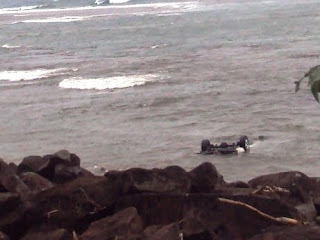 While we were there, 4 bodies were found in the ocean, and 1 very small body was found in the rubble. The mood was somber, but it was also numb and surreal. Briony and I had a conversation last night about the disparity between our situation in which we felt a little rumble yesterday morning, losing nothing, and the horrible situation of the people who live 20 miles away, who lost everything. It’s a difficult situation to reconcile. In any case, my school is closed for the rest of the week. I’ve heard about a possible meeting at the Peace Corps tomorrow morning to discuss relief-related efforts. And I’ll probably head out to the south coast again. Pictures below. Previous posts before that. Happy birthday, Chris! 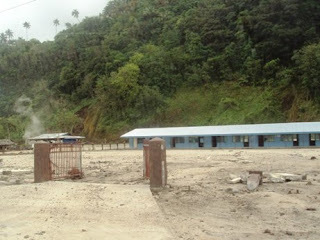 Saleapaga Elementary School was pretty devastated. There's a gate with no fence. Chunks of the street missing. Fale with only 2 poles remaining. Roof and remaining poles gone. 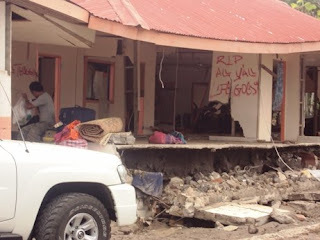 Mormon Church (famous in Samoa for being built to American construction codes) crushed. This house in Vailoa has words spray-painted on the walls that read, "We're Still Thugging" and "RIP All Y'all. Life Goes On." There were a bunch of photos on the dashboard of this car. 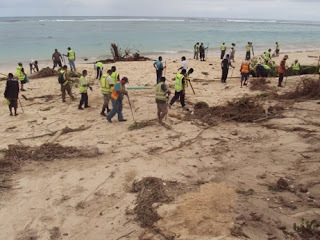 Volunteers combing the beach with sticks, poking the sand, looking for bodies. This family is wading around a submerged van. Sirens went off just before 5:30 p.m. yesterday as I was walking home from Mulivae. It was a repeat of yesterday morning watching cars rush up the mountain while (albeit less dense) crowds started up the sidewalks. Shortly after the evacuation began, the Peace Corps sent out a message saying it had been canceled. But standing on the Cross Island Road watching car after car move uphill and family after family carrying suitcases, I figured it might be foolish to stay at my house. I headed up to Blakey and Briony’s house and slept on their living room floor. 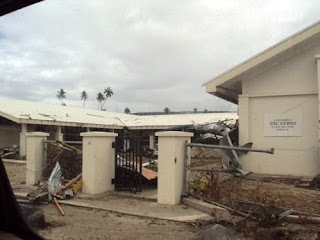 Schools in Apia are canceled today, although staff is supposed to show up anyway. When I showed up late this morning, the only two staff members present were Renita and me. There are some efforts by Peace Corps Volunteers to setup some sort of information post where we can update each other and fill in gaps in information. We’re also looking into relief efforts and ways people overseas can help, as I hear about them, I will let you know. In the mean time, the NZ Red Cross is taking donations specifically for the Samoan Red Cross. 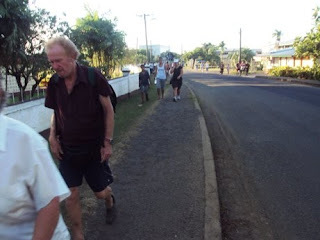 Tourists and Apia natives climb the hill. This family packed bags for the night. Fire Department moving to higher ground. Hi Matt- I still haven't had word on Tafitoala yet. I can't get ahold of my family still. I'm glad that you are okay - but so sad for Samoa. I'm thinking of you always. Be safe. Hi, Tonya forwarded the article from the Sydney Morning Herald with your photo and quotes. Here's the link: http://www.smh.com.au/environment/i-could-hear-the-waters-rushing-up-and-tearing-trees-down-20090930-gcay.html. I hope you are doing ok. Stay safe...you are oonstantly in our thoughts and prayers. Clicked through to your blog from the NYTimes. I'm hooked. Great writing. Great account of the tragedy. I'll be back. Keep it up. Matt- Thanks for posting the pictures and updating your narrative. Such horrible devastation. Was able to speak to Philip so I know you are all safe. Keep yourself healthy with all the possible/probable disease lurking. Glad to read that the PC will be organizing you all to help with the relief. 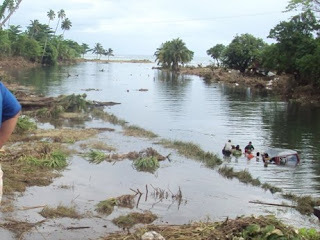 We are heartbroken for the Samoan people and thankful that the PCVs are there to assist. This is so hard to read, I can't imagine actually being there. My thoughts are with you all. Hi there Matt. Thanks so much for posting what you have here. We've been watching the news all day. TV One NZ has been great with updates on the half hour. 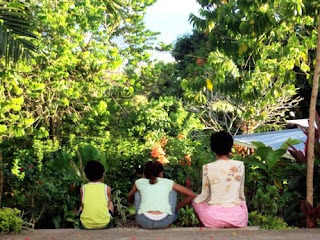 Being Samoan yet far from the place brings sadness in that we cannot physically give a helping hand. What a huge blessing to have people like yourself who obviously care deeply for Samoa. Praying that you all have the strength to keep up the important job you have there. You make a difference. With much respect. I can't even describe the feelings I have over this. I know you will be doing good work in the days/months to come. Thanks for the updates. I am checking your blog many times a day now. Thank you for blogging about your experience, I just happened to read you were in my families village (Saleaaumua) and am so relieved to know they most likely have water! Matthew, I'm following through your blog the after-earthquake news. I send greetings to you and all friends of Samoa. And I pray for all the brothers who suffer. Matthew, I wanted to respond last night...I was online as you were posting but I was completely overwhelmed. It was so so sad to read. I can only imagine how this experience has been for you...certainly living through something like this will change you forever. I got an email from Jim and Kathy. They've been following your blog and they wanted you to know that they are praying for you. We are, too. We love you. Matt, we are a group of consultants from Denmark working for the Ministry of Health. 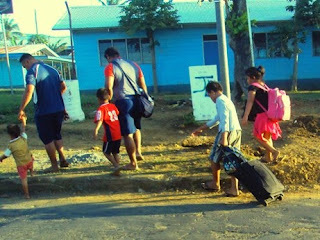 We had been in Samoa for 2 months, left just days before the disaster. Your blog is being shared far and wide here with colleagues and collaborators, as it really gives a sense of what it feels like to be in this catastrophe (especially as a foreigner). Thanks for your amazing reporting. Greetings from Copenhagen. "But nothing is more sobering than driving through a familiar village and finding it unrecognizable. 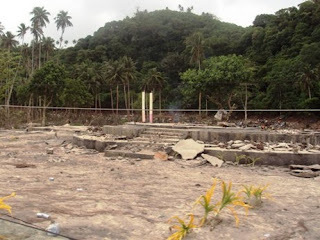 The Faofao Beach Fales are gone."